Eph. 4:23 - Be renewed by the spirit in your mind. Put on the new man created in righteousness... Gen. 2:7 - And man became a living soul. This chart above depicts the spirit of the person who has been born again from heaven. The man who has not been reborn has a wandering spirit and cannot understand or obey the things of God. However, thanks to our Lord Jesus Christ we CAN have a born again spirit that will lead us into all truth and teach us the things of God's Spirit. God's Word teaches us that in order for a person's spirit to be reborn he or she must make a confession with their mouth to another person of their belief in the Lord Jesus. Romans 10:9-10 tells us, "If you confess with your mouth the Lord Jesus and believe in your heart that God has raised Him from the dead, you will be saved. For with the heart one believes unto righteousness, and with the mouth confession is made unto salvation." Also, Jesus tells us that if we confess Him before men, then He will confess you to the Father and be your advocate legally before the throne of God (Matt 10:32, Luke 12:8). Your profession of faith in Christ before another person is a legal matter in heaven, and it is only through Jesus that we can legally be reconciled back to God. God created your spirit, soul and body to be as one, but when we sinned in Adam, that oneness was broken and now our body (flesh) fights against the Spirit as Paul talked about in Romans chapters 6-7. Our flesh is in a constant warfare against our spirit. God is a Father, a Son and a Holy Spirit, but all three exist as one in unity. Since we were created in God's image, our spirit, soul and body is a similar trinity. However, SIN has killed us and this unity. Now, only our recreated spirit in Christ can renew our souls. While our spirits are born again and therefore "perfect" (Heb 12:22,23) at the point of our confession of faith, our souls must be renewed daily by the Spirit. 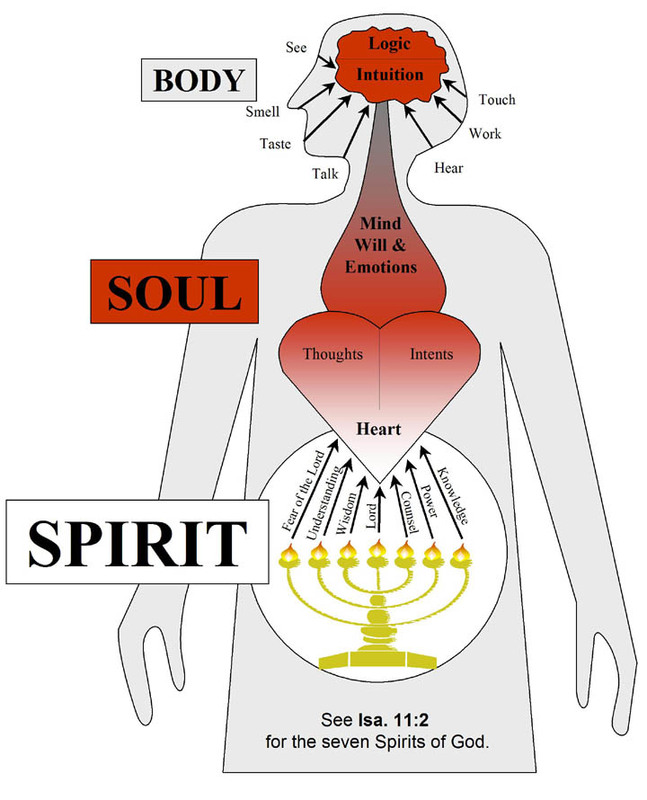 Please see the chart above again and notice how the seven spirits of God are constantly influencing our heart, while the body is constantly being influenced by other outside forces that are often contrary to the Spirit of God. Hence the warfare is in our souls, which is why James tells us that our souls must be "saved" or renewed day by day (James 1:21). Our soul consists of the mind, will and emotions, and your heart is the area where the spirit connects with your soul. Proverbs 4:23 says that we need to "guard" our hearts and keep them pure because the thoughts and intents of the heart will help guide the rest of our lives. God has given us a free will to make our own decisions, and our will and minds can be ordered either by the spirit or by the things around us. For this reason the book of Proverbs consistently admonishes us to pay attention to the seven spirits of God and how they "cry aloud" to us. Just a few examples include: "wisdom calls aloud," and "perceive the words of understanding," and "the fear of the Lord is the beginning of knowledge." Also, Paul prays for us in Ephesians 1:17-18 that the eyes of our heart would be enlightened from "the spirit of wisdom and revelation in the knowledge of Him." He prays again in Ephesians 3:16-19 that we would be "strengthened with might through His Spirit in the inner man, that Christ may dwell in your hearts through faith." So you can see that Christ does not necessarily dwell in our hearts just because we have been born again, it is something that must be cultivated through a heart that seeks after the things of the Spirit. These seven spirits of God are vitally important to understand. They are listed completely in Isaiah 11:2, but are expanded upon throughout the Scriptures. They are: 1) the Spirit of the Lord (love); 2) the Spirit of Wisdom (truth); 3) the Spirit of Understanding (revelation); 4) the Spirit of Counsel (remembrance/restoration); 5) The Spirit of Might (power); 6) the Spirit of Knowledge (scribes/publishing); and 7) the Spirit of the Fear of the Lord (grace). The best definition of worship is "free will obedience." The first use of the word "worship" in the Scriptures is in Genesis 22:5 where Abraham went to "worship" on Mt. Moriah by offering Isaac on the altar. There was no music or dancing or shouting, it was Abraham's free will offering of obedience. Part of worshiping "in truth" involves ordering our times of communion with God and with one another according to God's ways. Below is a chart that helps to describe the order that God is calling His people to worship Him in truth. 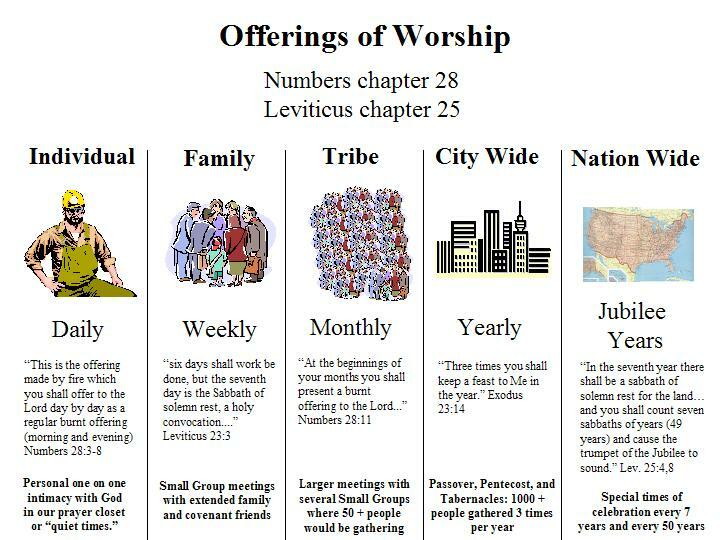 You can see that the Old Testament order for offerings of worship is a pattern or matrix to help contain the New Covenant life that we have together in Christ Jesus. Again, it is a free will offering of obedience to His word (worship in truth). Worshiping in truth is a matter of discipline according to God's word. We can discipline ourselves for times of worship according to our own good ideas, or we can do it according to the word of God which would be worshiping in truth. DAILY - The Scriptures indicate that at least twice a day we are to set aside a special time of prayer and communion with the Lord. In the times of Jesus they had three specific hours of prayer where people from the entire community gathered together at the temple for individual prayer during the 3rd hour (8:00-9:00 a.m); the 6th hour (11:00-12:00 noon); and the 9th hour (2:00 - 3:00 p.m).1 These three daily times of memorial proved to be prophetic during the crucifixion of Jesus (Mark 15:25, 33-34) as well as during other important biblical events (Acts 2:15, 3:1, 10:3,9). Daniel also prayed three times per day (Dan. 6:10). Whether we set aside two times per day or three times per day, the main point is that we should be fellowshipping one-on-one with the Lord on a regular basis daily. WEEKLY - Scripture says that God rested on the Sabbath and one of the ten commandments is that we should remember the Sabbath. So part of God's order to worship in truth is that we should set aside a special time of communion weekly with family and close friends to seek the Lord. These should be small groups so that discipleship can occur and everyone can share what God has been doing in their lives during the week. These open times of fellowship can be very organic in structure and may include a meal together. These meetings do not necessarily have to be in homes, but a home is the best place to foster the openness and transparency that is needed for true discipleship and covenant relationships. It should be hard to join these groups because you want to know those who labor among you, and easy to leave these groups because it is not about control, but love from a pure heart. MONTHLY - Israel observed the New Moon celebrations monthly on a larger scale than the weekly sabbaths (Num. 29:6; Ps. 81:3; Isa. 66:23). So in keeping with the biblical matrix, our monthly meetings should be larger meetings where some structure and pre-planning would most likely be necessary. These "tribal" type meetings would incorporate and network several small groups to share some of the more corporate things that the Lord has been doing in the smaller group meetings. The structure can vary from tribe to tribe according to the calling of your particular group or region of the country. The local elders and equipping ministries of apostle, prophet, evangelist, pastor, and teacher would be the ones to seek direction from the Lord for these meetings. Relationships between the small groups who meet together monthly should be strong and constantly developing. YEARLY - The city wide or region wide meetings that take place three times per year would also be organized and conducted by the equipping ministers of that city or area. These meetings would occur at the set times prescribed in the Scriptures to honor God's memorial days. Each of these holidays has its focus on the Lord Jesus Christ who is the fulfillment of all these Feast days. These three annual large-scale celebrations will help to promote unity and purpose for the entire Body of Christ in each city or region. The three main Feasts of the Lord include: 1) Passover/Unleavened Bread, 2) Pentecost, and 3) Tabernacles. Passover has a theme on deliverance and unity. Moses' Passover was enhanced at Jesus' first coming to become the Lord's supper. It is currently being enhanced again in our day to become the Marriage Supper of the Lamb at Jesus' Second Coming. The Feast of Passover is in fact the door to Christian unity as far as celebrating the Feasts of the Lord on a city-wide scale. The Feast of Pentecost has a theme of the Holy Spirit anointing people for service and includes public displays of worship. The Feast of Tabernacles is the year-end celebration of the general harvest where we look forward to the appearing of Christ to rule and reign the earth. Large outdoor festivals with "booths" (similar to our modern day tradeshows or arts festivals) would be a good way to honor the Feast of Tabernacles in each individual region. They are all about JESUS! This is only a brief look at the ways we can worship the Lord "in truth." Further information on the Lord's Feast days, and examples of how they are being celebrated on a city-wide scale can be found at my friend Robert Somerville's website at www.awarenessministry.org. This example is certainly not intended to be an exact replica of what needs to be done in other cities, but it is a good example from the Scriptures of how we can be doing "church" and assembling for worship both in spirit and in truth.